Many thanks to Noodles & Company for providing our complimentary dinner to try out their brand new Woburn location and amped up kids menu! All opinions are my own. If a love of food can be passed down from generation to generation, noodles would be my food. My dad loves noodles – from Italian pasta, Thai noodles, Japanese udon noodles and every other kind of noodles you can think of. We always ate noodles for anyone’s birthday since it represents long life. Well, my dad’s love of noodles has passed to me and that has passed to my daughter. We were really excited to try Noodles & Company. Have you been to one? They are popping up all over the place in MA right now. It’s a great alternative to other fast casual restaurants and super kid-friendly. What I love about the Noodles & Company concept is that everything is made to order and they have made huge efforts to remove artificial ingredients from their menus. Because of these great new menu changes, you can get delicious gluten-free options, customize your order to accommodate food allergies and even opt for low-carb or no-carb options by getting a BUFF bowl (they swap out noodles for spinach and ramp up the other veggies, too). They also added a great kid’s menu which Ninjette was pretty excited about. 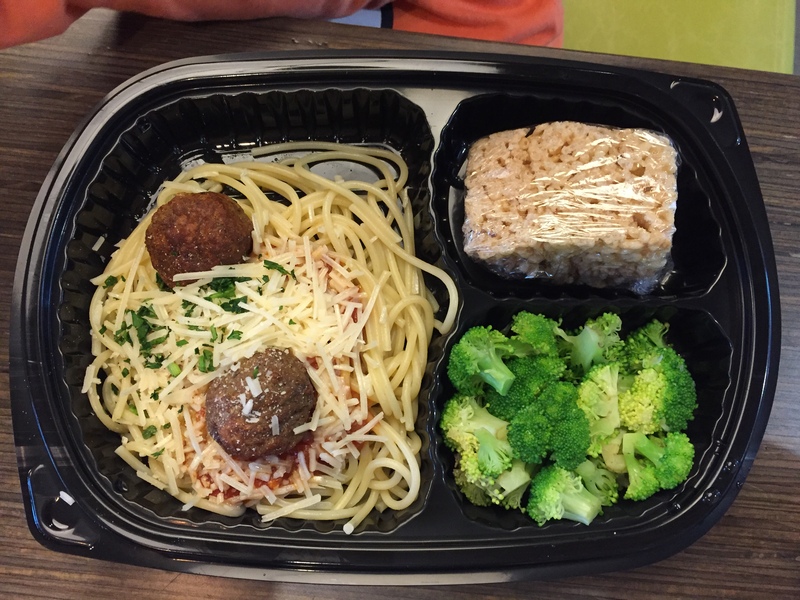 She cannot deny some Spaghetti & Meatballs with some broccoli and a rice crispy! It also comes with a choice of organic milk, an Honest juice pouch or a fountain drink. They were also amazingly accommodating about her food allergies. Their kitchen was open, so I could really see how they were cooking the food and I appreciated that they were taking the time to make sure there wasn’t any cross-contamination. Did I also mention that the food tastes great?! I’m always a little nervous about new fast casual restaurants because fast usually means the food doesn’t taste so great or you just don’t feel good after eating because it’s so processed and then nuked. 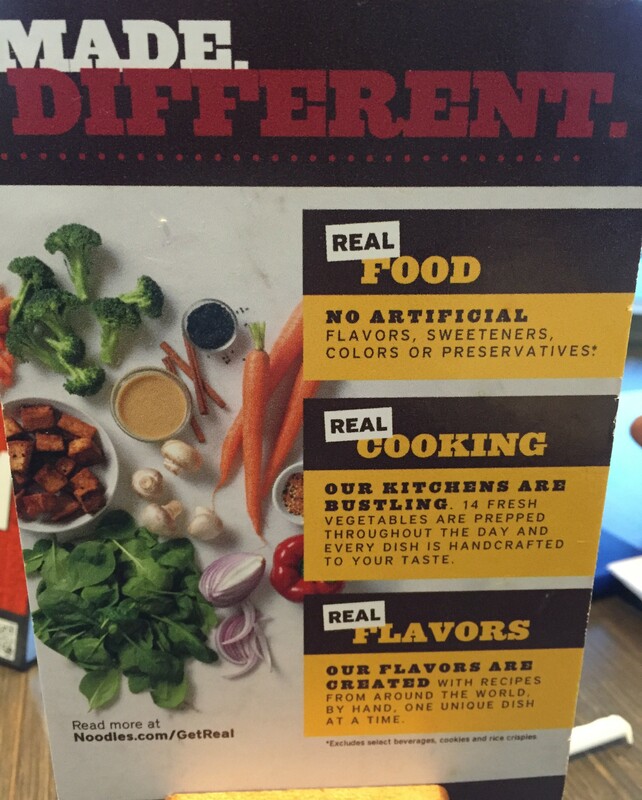 It was great to see Noodles & Company commit to using fresh ingredients that are prepped each day and to know that they were committed to real food! The salads and other dishes were pretty tasty there. We want to go back to try the potstickers and soups! For the month of November, Noodles & Company will be collecting non-perishable items for local food banks. Thursdays in November will be Family Night where kids eat free! One free kids meal for each adult entree purchase. Also, can I tell you how awesome their kid’s activity mat is? 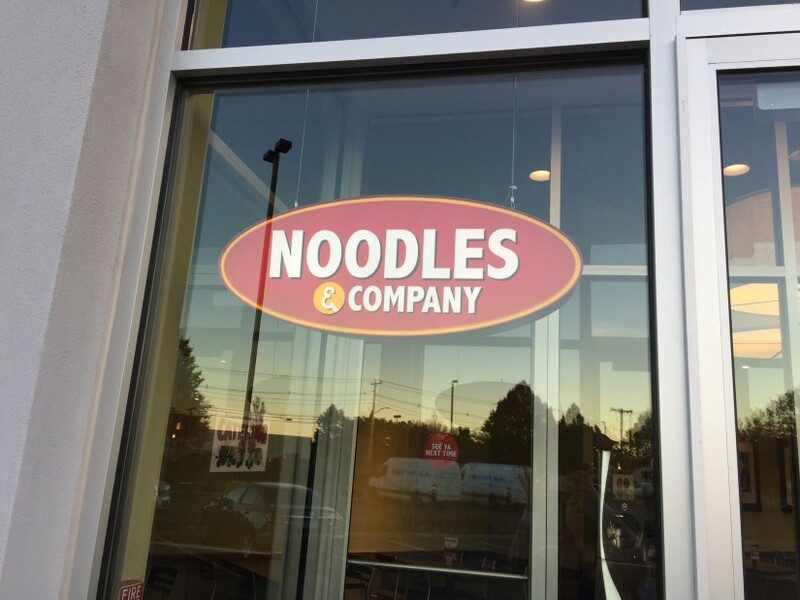 The last thing I will say about Noodles & Company is that you can order online and pick it up for a night in! I am having some friends over for dinner tomorrow night and we will be doing some babysitting right up until they come, so I put my order in for tomorrow night and dinner is all set! They have square bowls which feed 4-5 people and they even provide plates, napkins, and utensils. How easy is that? 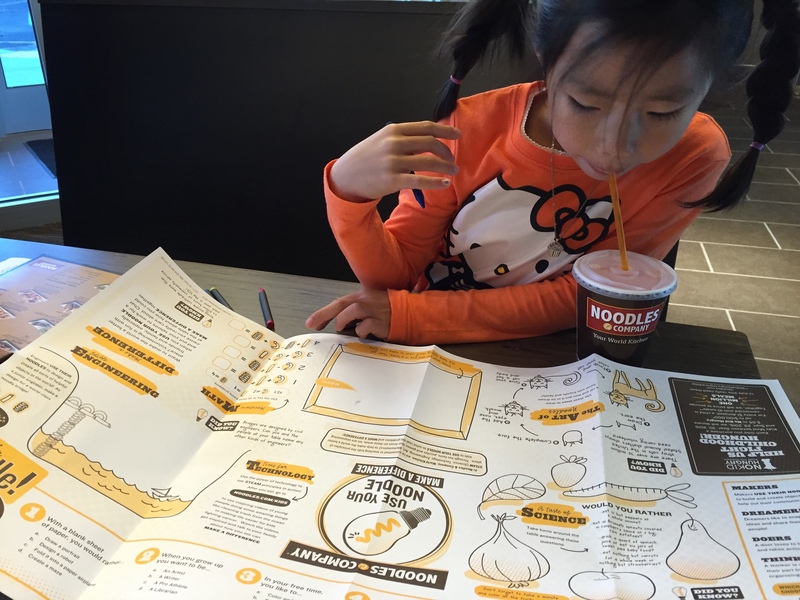 When you go check out your nearest Noodles & Company, let me know what your favorite dish is! There is a Noodles and Co. opening in our mall soon, so thanks for the letting us know what to look for!